In what could be a sign of things to come, ten campaign billboards of Democratic Party electoral candidates have been vandalized, with fears more may follow. 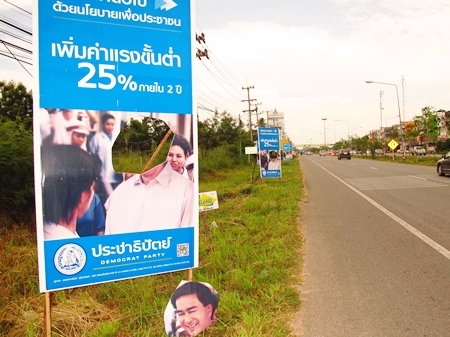 Sattahip District Chief Radjai Banditsilp reported May 15 that billboards near the Ambassador City Hotel in Jomtien were destroyed, with vandals cutting out the face of Prime Minister Abhisit Vejjajiva on placards bearing his promise to boost Thailand’s minimum wage 25 percent. Other billboards were torn down and tossed into the jungle. Ten campaign billboards for Democratic Party electoral candidates have been vandalized near Ambassador City Hotel in Jomtien. Jakkrit Kraimat, head of the Democrats’ office in Chonburi, said he is pressing for an investigation into the vandalism. Tensions are high in anticipation of Thailand’s July 3 general election that will pit supporters of fugitive former Prime Minister Thaksin Shinawatra against the Democratic Party, which came to power through backroom deals orchestrated after a Thaksin-backed government was ousted from office by a judicial decision in 2008. A pro-Thaksin MP was shot in Bangkok May 11 and police fear more violence may occur before this summer’s polls.